Tauchen Sie ein in eine besondere Welt der Geschenke! We offer a fine variety of hand carved crips made of wood (maple and lime). At our shop you find a selection of wooden figures (maple and lime) in all sizes and a range of colours. Embellish your home with a thousand ideas – from small to prominent and eye-catching. No matter of the occasion – at our shop you will find appropriate presents all year around. We offer gift ideas for birthdays as well as for anniversaries, ceremonies or just to surprise your beloved ones with a creative piece of art. 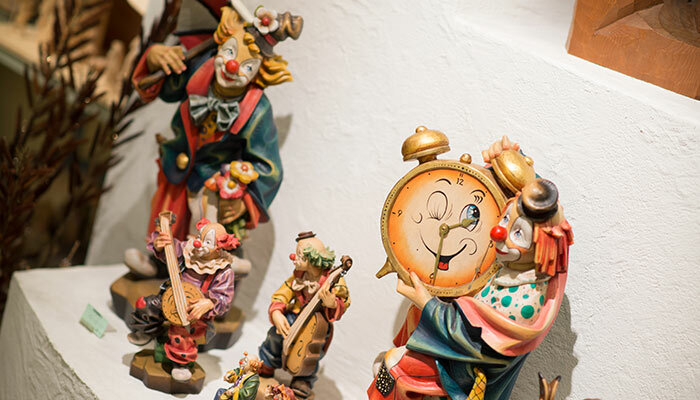 At our shop we offer woodcarvings and wooden sculptures of highest quality. Beside that, we have a wide range of fine wooden presents. Take a tour through our gallery and discover our diversified products from local postcards up to bowls out of arolla pines. We would be happy to welcome you at our shop in Neustift!